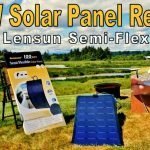 Recently a solar panel manufacturer called Lensun sent me out a 100-watt flexible solar panel for a Love Your RV! product review. 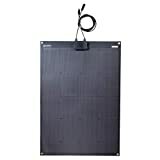 One of the reasons I agreed to review the panel was a plan in the back of my mind to utilize it as a portable solar panel. 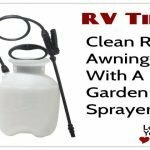 It would make a handy addition to my rigs boondocking solar system. 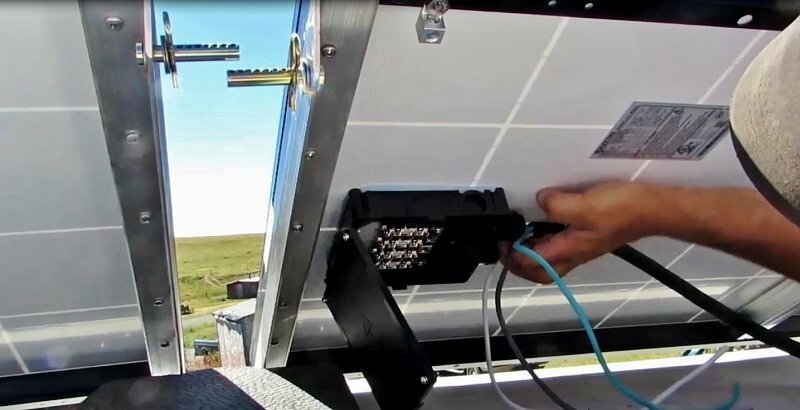 The current solar power system consists of 4 – 100W Renogy solar panels attached to the roof of our fifth wheel trailer. 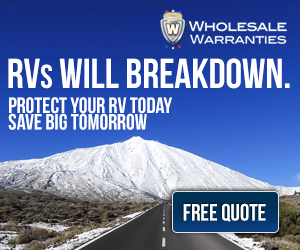 They do a good job at providing us adequate power for our dry camping needs. However, I have been kicking around the idea of adding a 5th solar panel to be used on the ground. Everyone can use more power. Right? Why would I want a portable solar panel? Catching some power off early sunrise and late sunset when the roof panels aren’t producing. 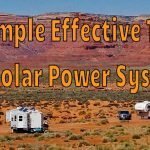 How Will the Portable Solar Panel Be Hooked Up? It should be fairly straight forward from an electrical perspective to hook the 5th panel into my current solar system. I have my system set up with the 4 panels wired in parallel feeding my Bogart SC2030 charge controller. Since the flexible Lensun 100 watt panel has similar specs to the glass rigid framed Renogy panels it’s a simple matter of adding it to the system in parallel. The 30 amp Bogart controller should handle the 500 watts just fine, though it will be near its capacity. 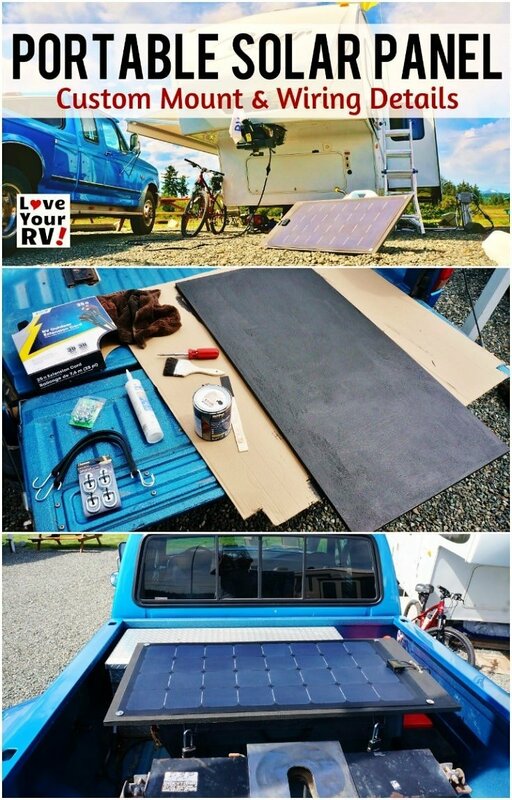 Hooking the portable solar panel up physically will be a little more challenging requiring quite a bit of wiring and mounting modifications. 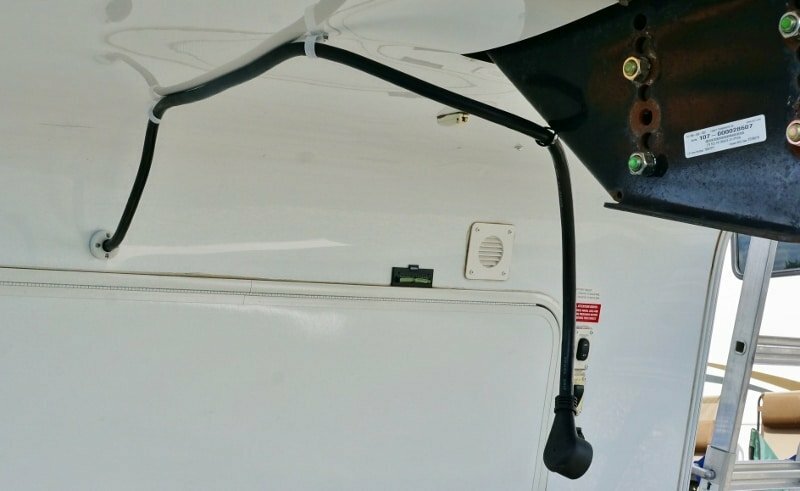 Most of the store bought remote panels come with a charge controller built in and simply connect to the battery bank with a set of power cables with alligator clamps on the end. I plan to do something a little more elaborate with my setup. 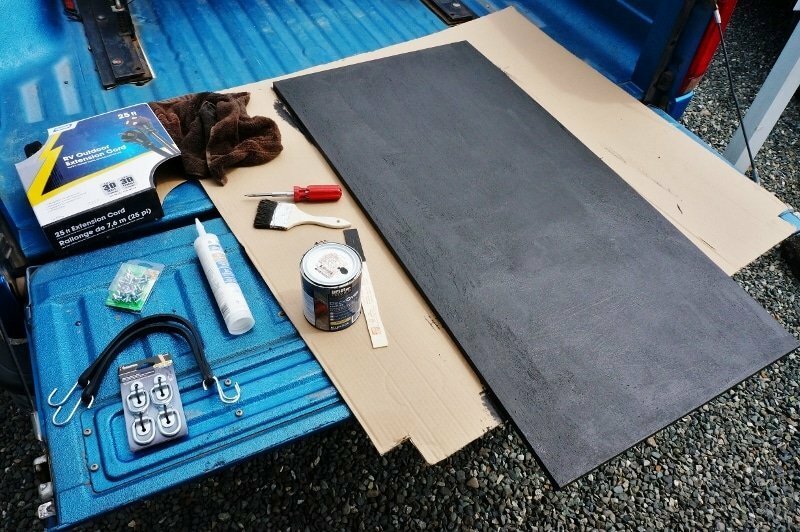 I want my panel to be mounted to my truck bed tool box. 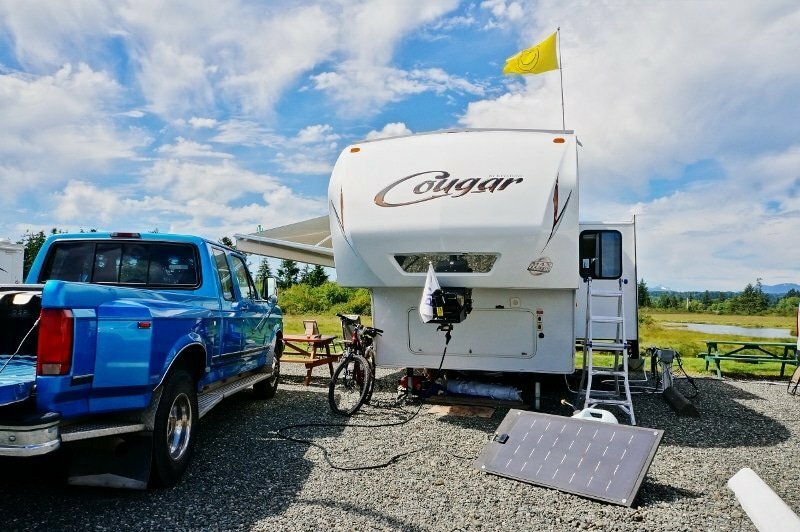 It must be capable of providing solar power to the RV battery bank as we drive, just like the roof panels. But, I also need it to be detachable so I can deploy it as a remote ground panel when desired. Being that the flexible Lensun panel is so light and bendable I will need to mount it to a board or frame of some sort. To work with I have a large heavy duty plastic tool chest in my trucks bed situated just in front of the hitch. I decided to take the flexible Lensun panel and mount it to a chunk of 3/4 inch plywood then attach the plywood to the tool box lid. First, I painted the plywood with a liberal coating of Behr Deck Over paint. 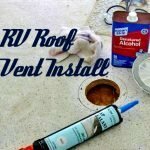 This tough coating will protect the plywood from water intrusion. Next, I attached 4 rings to the bottom side to hold the plywood in place on the tool box with a ratchet strap outside and bungees inside. To affix the Lensun 100W panel to the plywood board I used silicone sealant all over its backing and added screws and washers to the 4 corner grommets. For the two output wires, I added a strain relief clamp to avoid damage to the panels junction box. 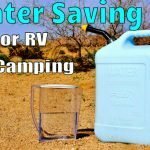 I bit the bullet and invested in a 30 amp RV power extension cord to use. It will transfer the Lensun panels output current to the charge controller. I felt it would be perfect for my application. It’s made with 10 gauge wires and heavy enough that it won’t move around at highway speeds sitting in the truck bed like a set of smaller separate wires would. Also, the plug and socket have large brass blades making a solid connection. The cord is 25 feet long. I cut it a point that would give me about 18 feet of range from the fifth wheels front pin box and soldered its wires to the Lensun panel’s output wires. Then added shrink tubing and rubber tape. Since the 30-amp RV power cable has 3 conductors I doubled up the negative line to lessen the wire losses a little bit more. As for the other part of the power cable, it needed to be run from the back of the trailers pin box into the front storage compartment. I figured I could fish it through the front fiberglass cap area but that turned out to be a much more difficult proposition than I had bargained for. To simplify and speed up the installation I decide to *gasp* drill a hole in the fiberglass! The wire could then be run under the front cap and straight into the compartment. 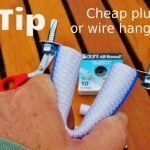 I visited a local marine parts supply and asked if they had anything to ensure a waterproof wire feed through fiberglass. The clerk recommended to me a product called a Blue Sea “CableClam”. It took a bit of effort with my drill to get the rubber seal just right but it proved to be a perfect solution and looks really professional, much better than a big blob of caulking. After I got the power cable into the front storage compartment it was just a simple matter of dressing the wires and hooking the positive and negative ones into my existing system. While doing this I decided to upgrade from the existing 30 amp fuse to a 40 amp switchable breaker making it super easy to turn off the panel feed to the charge controller. 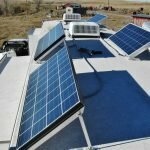 Special note on Solar Panel Fusing – I do have a 40 amp breaker between my solar panel array and my charge controller but to do it properly I should have each individual panel fused as well. This is because if one of the panels was to develop a short circuit the other 4 panels could feed excessive current into it possibly overheating the wiring. I’m torn whether to add the 5 extra fuses as it would introduce many more points of power loss and increase the chance of a bad connection in the system. I thought it best to mention it, though. 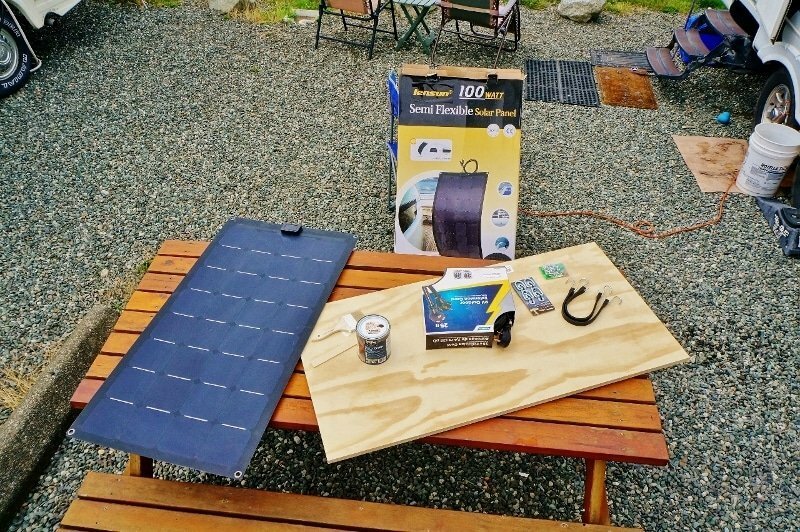 I think this portable solar panel will prove to be very handy for our southern desert boondocking come this fall. Not only is our solar capacity now 500 watts but we have the 100-watt remote panel to catch the early morning sun. By mounting the panel on the thick plywood it should be able to handle the high desert winds better than a lighter metal or plastic frame. I can always lay it flat if things get really gusty. I may add some kind of tilt bracket to the back but at this point, I don’t think it will be needed. I should be able to simply lay it up against something like our 7-gallon water jug or my Werner Folding Ladder. My first test of the system showed a total solar output of 27 amps. I’m a happy camper! Update October 10/2017 – The panel was damaged when a strong wind gust grabbed it and blew it over onto some rocks. I now have swapped out the Lensun with a rigid Renogy solar panel. I’ll have to lash it down better.